The NRDC gang of Rockefeller aristocrat types is up to its ears in the corruption that is New York these days and now there’s even a French Connection. 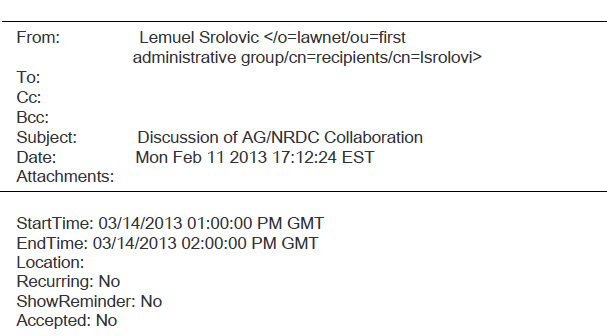 Back in November, we laid out how the NRDC gang had created what we later called the La Jolla Junta and hatched a RICO type scheme to go after Exxon, the owner of XTO Energy, which just happens to threaten the very special interests of the gang in making a wilderness of the Catskills. Then, the gang over-reached, launching a follow-up scheme in coordination with loyal hacks such as New York State Attorney General Eric Schneiderman, the nasty ambitious pol and attack tarantula who is happy to do the dirty work harassing everyone from tiny communities such the Town of Sanford in Broome County, New York up to Exxon, barely bothering to disguise the obvious coordination of attacks between his office and the NRDC gang. Now, thanks to Energy In Depth (EID), we’re learning more everyday about the depth of the corruption and a French connection has even been revealed, although it’s not what you’re thinking. 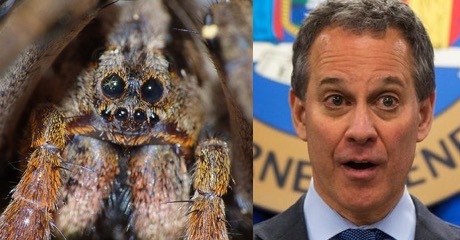 Schneiderman has worked closely in tandem with the NRDC gang and has also brought on Lemuel Srolovic, a trial lawyer from the same law firm as now-convicted felon and former New York State Assembly Speaker Sheldon Silver, to help with the coordination and as EID has discovered, the cozy relationships between all these folks are slowly but surely coming to light. You need to read the entire piece, entitled “Massachusetts AG Admits to Preconceived Verdict Prior to Launching RICO Climate Investigation,” but what caught my attention was the detailed evidence of the NRDC gang acting as if the Attorney General’s office was little more than an outpost for them. 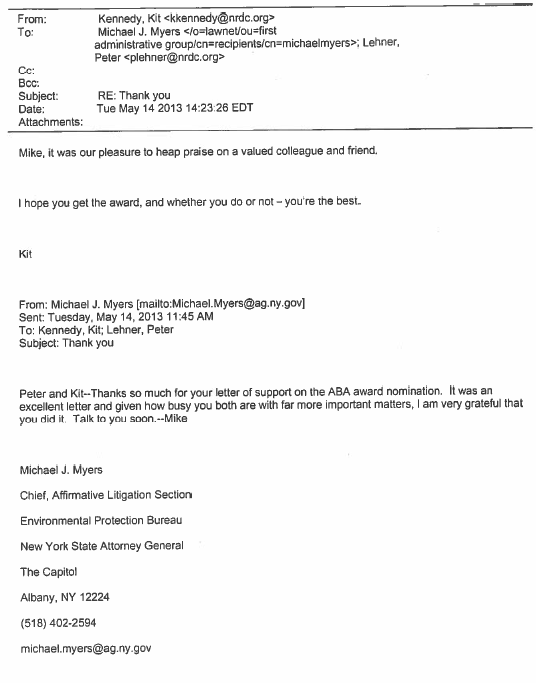 Attorney General Schneiderman’s office also has some pretty cozy relationships with environmental groups, as recently uncovered emails released by E&E Legal show. 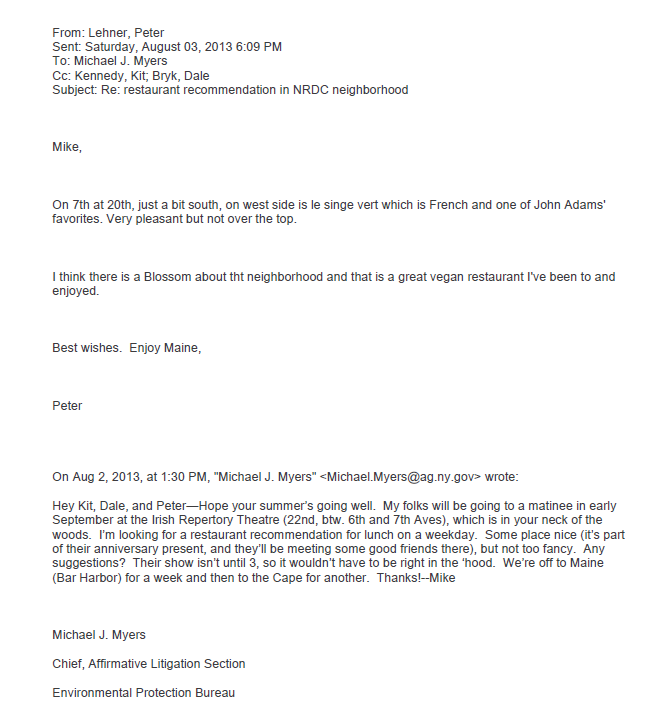 The emails reveal that Schneiderman’s staff is in near-constant communication with activist groups on a wide range of issues, from coordinating their approaches to court cases to recommending good restaurants. 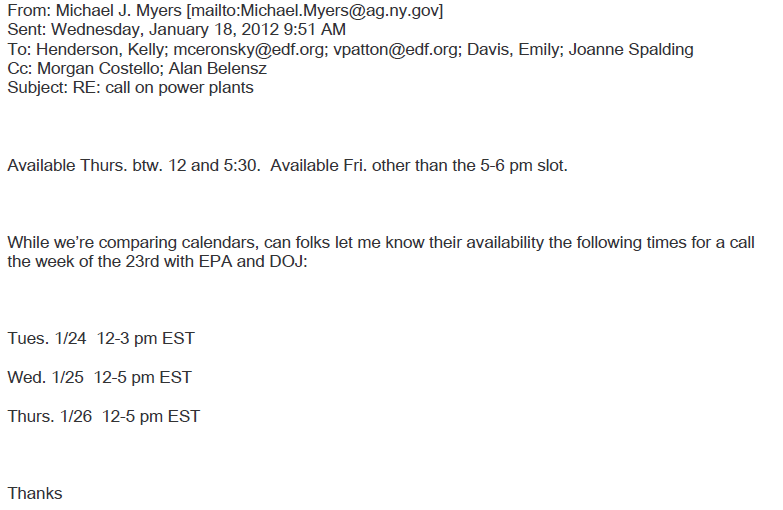 It’s pretty astounding when you understand just deeply ingrained the NRDC gang is with Schneiderman’s office, but that isn’t all, because another name that surfaces in these e-mails is that of Kit Kennedy, who did one of those rotating door moves, like her brother-in-arms Joe Martens, moving from the NRDC gang into state government and back again later. Empire State corruption is deep and it begins and ends with the NRDC gang, who is desperate to drive XTO Energy (Exxon) out of the Catskills so it can have free rein. As ms Kennedy from NRDC says in her blog post one picture (or two) might be worth thousands of words. Since ms Kennedy proudly displays pictures of governor Cuomo at an event vetoing the port Ambrose import project with activists like Jessica roff of catskillmountainkeeper and Eric weltman of food and water watch surrounding him and Jessica and Eric and others spent years broadcasting a conspiracy theory about how Port Ambrose was secretly a plot to export Fracked gas, what might that say about who ms Kennedy chooses to associate with? Or what standards the environmental orgs hold themselves to? Remember these are groups who attempt to hold politicians and regulated and more accountable for their actions and decisions and the groups are accountable to no one themselves. Great Photo – the Tarantula is obviously better looking. Also – the links for articles highlighting the two-faced Massachusetts politicians are always a bonus! Thanks.